I received this (care of the library) today. 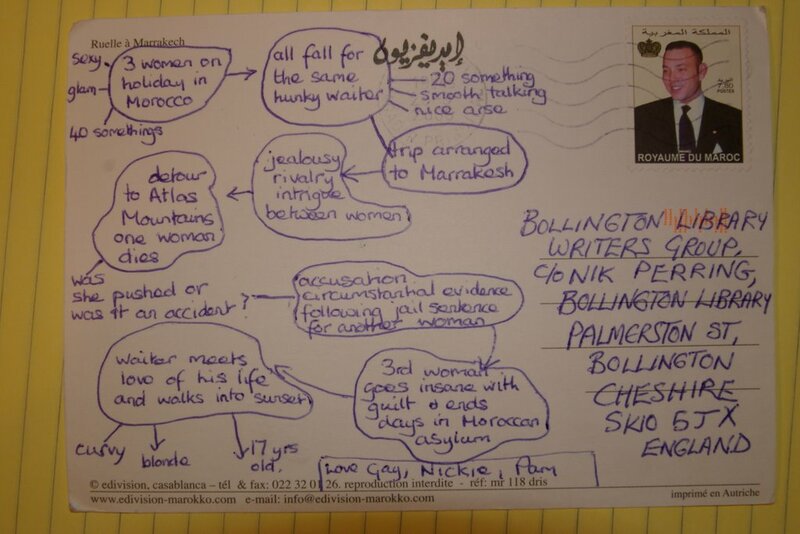 It’s a postcard some of the members of my writing group sent from Morocco. The week before they left we’d been looking at planning and plotting stories, so I was very impressed that they were still thinking about it while they were on their hols! Brought a smile to my face anyway! Thanks girls. I’ve had another reasonable day of writing, which is, of course, good. Shame the weather’s been a bit miserable, especially after two or three of the best days of the year. Such is life. It could be a lot worse. Right. Back to the writing while I’ve got the time. I’ve got to prepare for Saturday’s appearance at my local library and a mid-week date at a school in Kettleshulme, at some point soon. That’s a brilliant postcard Nik,You don’t suppose that they have a bit of a thing for – YOU! Ha ha! I very much doubt it, Kev!